Marvel plan on breaking us down yet again. We all ready and recovered from Avengers: Infinity War? What, no? Well, sorry to disappoint, but Avengers 4 is coming in with a hammer blow of its own. The Avengers 4 synopsis is not only here – it is devastating. It’s given us a much clearer idea of where the movie’s going, too. ComicBookMovie’s Rochi Shion has come across the Avengers 4 plot synopsis in License Magazine. Are you ready? It’s heavy. "A culmination of 22 interconnected films the fourth instalment of the Avengers saga will draw audiences to witness the turning point of this epic journey. Our beloved heroes will truly understand how fragile this reality is and the sacrifices that must be made to uphold it." Culmination. Turning point. Sacrifices. That is not good. One thing that definitely caught my eye, though, was the pointed reference to a fragile reality. Multiverses and time travel, anyone? That’s as close as we’ve gotten to official confirmation. We’ve seen things like Cap in his old costume in an Avengers 4 set photo, but never outright mentions of reality itself breaking down. Plus, if it wasn’t clear enough already – we’re getting deaths. Again. You don’t throw around the word ‘sacrifice’ willy-nilly without it meaning something. Marvel made it abundantly clear that they weren’t messing around in Infinity War and that they will destroy everything you ever cared about and leave you a sobbing mess in the cinema. And they’re going to do it all over again. 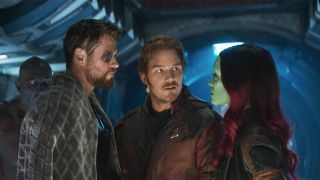 It sure sounds like we're going to need to brush up on the Infinity War ending, even if it does make us all sad inside.